In a small mixing bowl, mix together the strawberries, mint and the 2 tablespoons of sugar. Let sit for at least an hour in the fridge. You can make this the same day as the pie, and let it sit overnight with the pie, if desired. In a small mixing bowl, stir together the graham cracker crumbs, melted butter and 1/3 cup sugar. 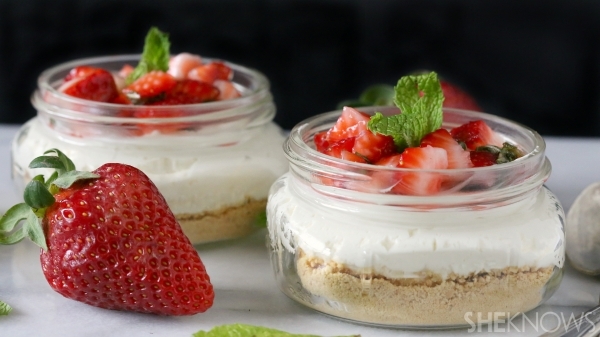 Press the mixture into a 9-inch pie plate or into your mini cheesecake containers. In the bowl of your electric mixer, add the cream cheese, lemon juice and lemon zest. Beat together until thoroughly mixed. Pour in the heavy cream, and beat on low until it’s combined. Turn up the speed to medium, and beat until the mixture starts to thicken. Pour in the remaining 1/3 cup of sugar, and continue beating until whipped and creamy. Spread the cream cheese mixture into your prepared pie plate (or mini cheesecake containers). Let the pie sit overnight, and then top it with the strawberry mixture.